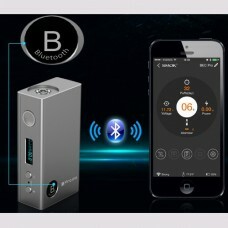 50 watt Bluetooth mod from Smok. This is going to be awesome. Smoktech has launched its own smartphone app for IOS and Android, meaning the settings can be changed from your mobile device. The mod features an intelligent display, anodised aluminium body and large battery capacity. The mod supports pass-through charging so there's no need to remove the battery in order to charge the device. This is a real premium box mod. Finally, proper next gen features in a vaping device.